Welcome to the Holiday Inn Express and Suites in Elgin, Texas, one of the closest all non smoking, pet friendly hotels outside of Austin, Bastrop, Hutto, Taylor and Giddings! Located only minutes from Austin, home to the annual South by Southwest (SXSW) Film and Music Festival. 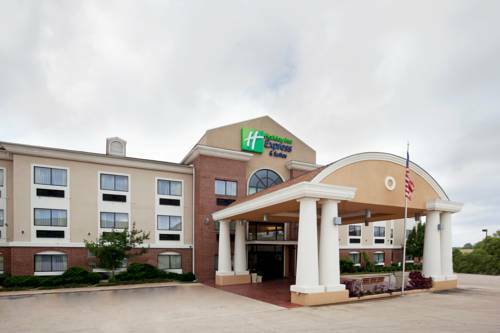 The Holiday Inn Express and Suites is the premier hotel of choice for visitors desiring quick accessibility to the city, while avoiding the high prices and traffic. Ideally situated directly off of Highway 290, we are located between Houston, Waco, Dallas and San Antonio. We make the perfect place to stay if you are attending events in Austin, Circuit of the Americas, Formula 1, MotoGP, XGames, Austin Rodeo, Austin City Limits, Texas Longhorns Football games, Sherwood Forest and FIA World Endurance Championship just to name a few. Traveling on business, our hotel is ideally located close to three major brick manufacturers namely the Luminant Power Plant, Austin Community College and a proud supporter of our Military and our own Camp Swift Neighbors. Sites you might not be aware of World renowned Elgin Veterinary Hospital, award winning Meyers Sausage Company and Southside Market and BBQ. We have a charming little Ghost Town just a few miles away and every Saturday join us at the Farmers Market down town. Stroll around town and take in the shops and dining, do not miss the opportunity to see our Award winning neighbor The Owl Best Downtown Business, population under 50,000 in all of Texas. Elgin Southside Market: World Famous BBQ. Original Elgin Hot Sausage. Known for being the first BBQ restaurant in Texas, established in 1882. Restaurant, Retail Meat Market and Catering. Meyers Elgin Smokehouse: BBQ Retail Market. Sausage Capital of Texas. Founded in 1949 their Sausage roots go back to the late 1800s. Voted Best BBQ in Elgin by Elginites 6 straight years.Their Sausage can be found in most grocery and WalMart stores throughout the state of Texas. Jalisco's Mexican Restaurant: Mexican Restaurant and Bar. Homemade flour tortillas. Good selection of menu items. Happy Hour Specials. Located next door. Morelia Mexican Cafe: Extensive menu. Beef, Pork, Chicken, Seafood, Pasta, Steaks and much more. Great authentic taste. Austin Convention CenterNeal Kocurek Memorial Convention Center. This is a multipurpose convention center. It is also home of the Texas Rollergirls. The convention center has 5 exhibit halls, 54 meeting rooms and 2 ballrooms. One of the ballrooms is the largest in Texas.